If you are in the area on March 22 (5:30 - 8:30), stop by the studio for an evening of Art & Wine. Atascadero's Art & Wine tour will be taking place and approximately 25 businesses in the downtown area will be hosting artists and wineries. Wine tasting wrist bands are available (at Bella Cose) for $10 and the art and food is free. 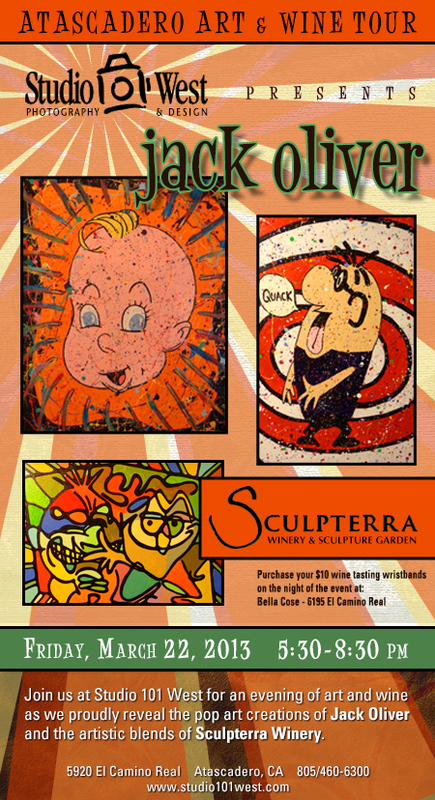 We will be hosting the smooth blends of Sculpterra Winery and the debut of Jack Oliver's whimsical pop-art. Hope to see you there!